The Samsung Galaxy S10 is still probably months away from release. However, this has not stopped the case-maker Olixar from designing a whole range of cases for it already, or the e-tailer site MobileFun from posting a product page for them, prices and all. The Galaxy S10 in these images appears to mimic an earlier leak. The Samsung Galaxy flagship line for 2019 is rumored to contain a more diverse range of models than usual. Besides the typical Galaxy S10, there may be a Galaxy S10 Lite, an S10 5G variant and an exceptionally souped-up take on the Galaxy S10 Plus with as much as 12GB of RAM and 1TB of internal storage. These putative options are rumored to have either three or four rear cameras each, and will drop the rear-facing hardware fingerprint scanner for one embedded in the display. A new range of cases, made by Olixar and released publicly by its retail partner MobileFun, show that a recent design-based leak claiming to show the basic Galaxy S10 form factor is gaining credibility in the phone accessories market. It shows a phone that, as before, somewhat resembles the Galaxy Note 9 in its proportions. However, this phone has sprouted an extra rear camera module compared to the 2018 phablet, and needs no other cut-outs on the rear panel. 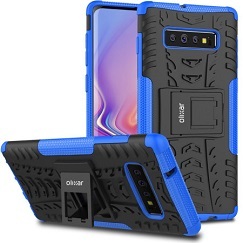 Olixar's new Galaxy S10 cases come in the brand's usual ArmourDillo, FlexiShield, NovaShield and Ultra-Thin designs. Unfortunately, the screen is shown as inactive in all of these images, making any further confirmation of the rumored dual Infinity-O cameras impossble. These cases are being offered for pre-order on a live MobileFun page, and start at US$5.49. Unfortunately, the product pages do not mention when they would be shipped, thus giving no clues as to exactly when in 2019 the Samsung Galaxy S10 will launch.